"Five years in the making, Montreal's Akitsa delivers their fifth album of spirited and inevitable black metal fatalism. 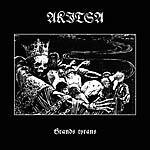 A respected and passionate disciple of the black metal underground from its earliest days, Akitsa's Outre-Tombe has remained true to the spirit of the genre, while carving out a personal space within it. Akitsa was founded in an environment of isolation. 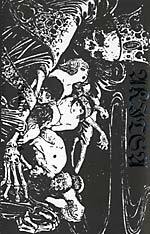 A pre-Akitsa Outre-Tombe gained experience from early maneuvers out of the DIY cassette culture of the early 90's experimental mail circuit, and he eventually transmuted this abstraction and freedom back into misanthropic black metal -- and Akitsa was born. This passionate yet primitive North American black metal pioneer came into existence regardless of any local indifference to the need for it. Fusing a love for industrial noise, punk, and creepy synth soundscapes with pure raw black metal, Grands tyrans is the most challenging, powerful, and fully realized synthesis of these various strands to date. 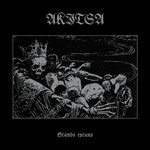 While sonically Akitsa has matured into a perfect amalgamation of extreme music (metal, punk, experimental), Outre-Tombe's voice has the rude and fearless energy of youth expanding upon the diversity of emotions that black metal festers in the complex mixture of violence and introspection. Grands tyrans masterfully strikes with urgent immediacy like the falcon springing through frost covered branches commencing the hunt." 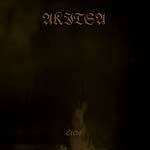 "Dedicated to imperfection and obsessed by minimalism, Akitsa return after 3 years with their fourth full-length album. Brash primitivism, bitter atmosphere and youthful naivety clash together, firing the rawest hate anthems in the Akitsa cannon. The most undisputedly cruel faction of raw North American black metal seen thus far."